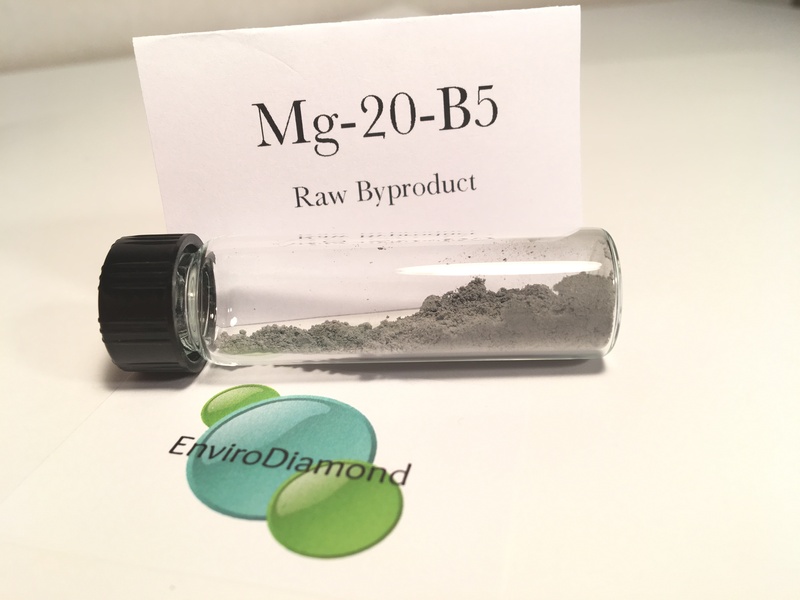 We are cultivating a new field of materials synthesis and are focussing on magnesium products first. 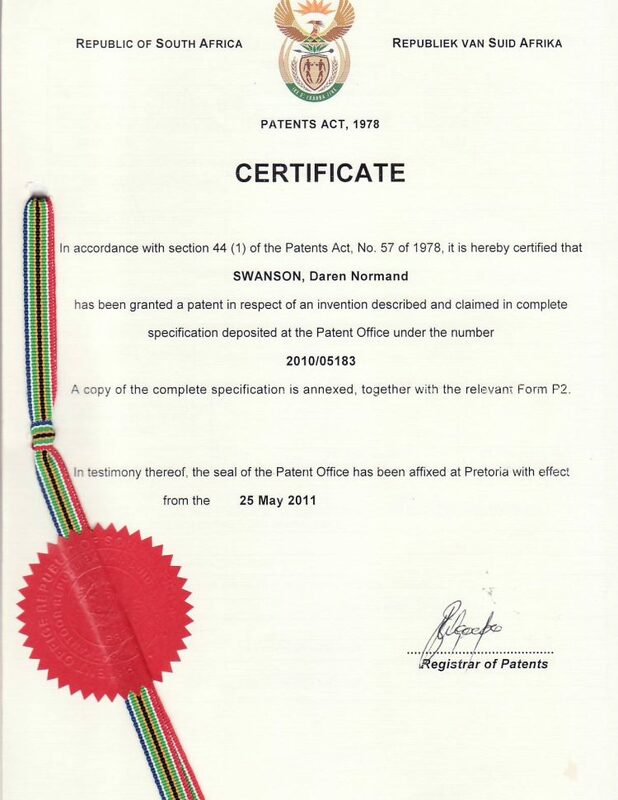 Here are some other products that we are in the process of creating, testing and developing. This material is simply remarkable in appearance and behavior. We performed some microscopy work on a sample, which revealed complex particles that are covered in other materials. 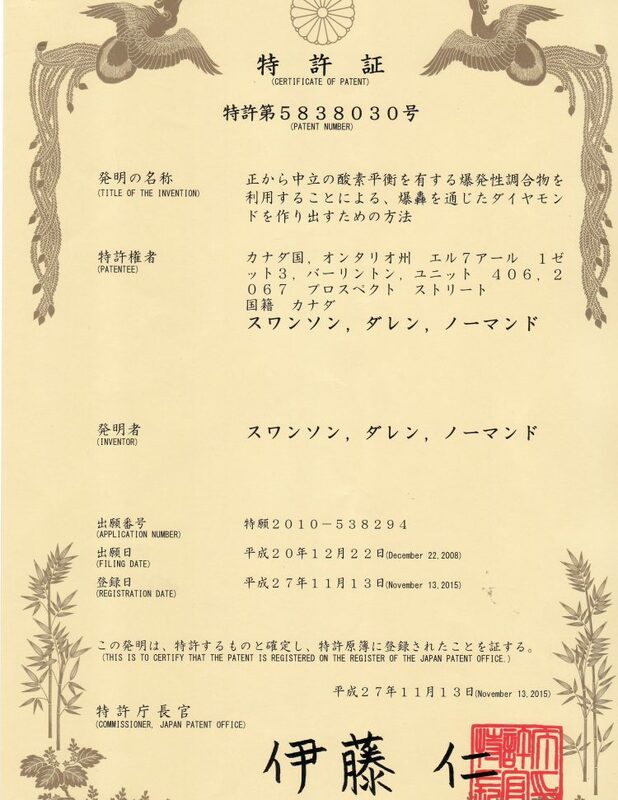 We are still conducting tests on this potential product. 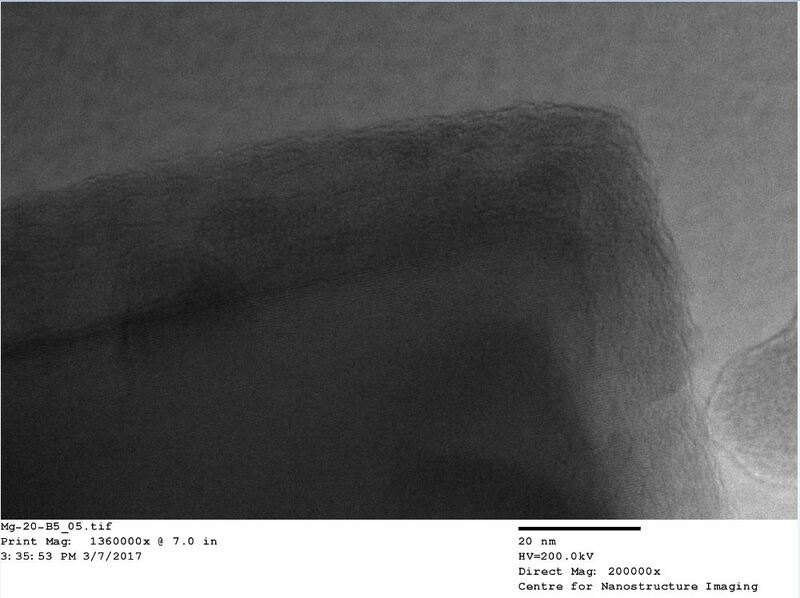 HR-TEM of a crystal produced from a boron shot, covered in wavy nanomaterial. Detonations with boron have been envisioned to generate boron-doped nanodiamond, which has a valuable electrical effect that is sought after in the microelectronics industry. 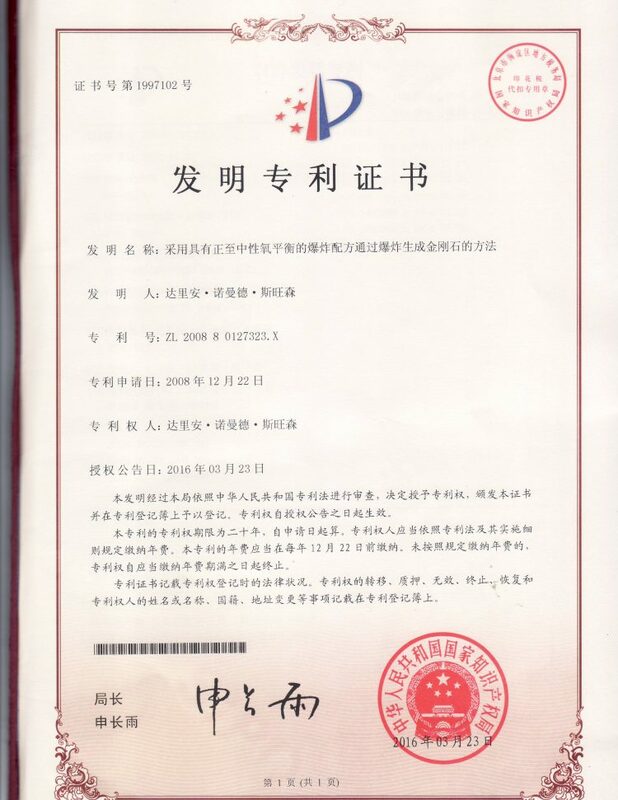 We also anticipate the creation of some boron carbide, which is a commonly used superhard abrasive material. Boron carbide, if enhanced by diamond, would likely be quite similar to diamond. Interestingly, as of 2015, boron carbide is the third hardest substance known, after diamond and cubic boron nitride, earning it the nickname “black diamond”. Surprisingly, one variety of this super dense material was analyzed and found to contain Forsterite (found in comet dust and meteorites) and Grossmanite (only previously found in the Allende meteorite). We also identiﬁed structures that are only found naturally in rock deposits from Italy and Poland. Through microscopy we learned that the addition of silicon to a CDP formulation produces particles with rougher edges when compared with material that comes from a carbon dioxide + magnesium detonation only. 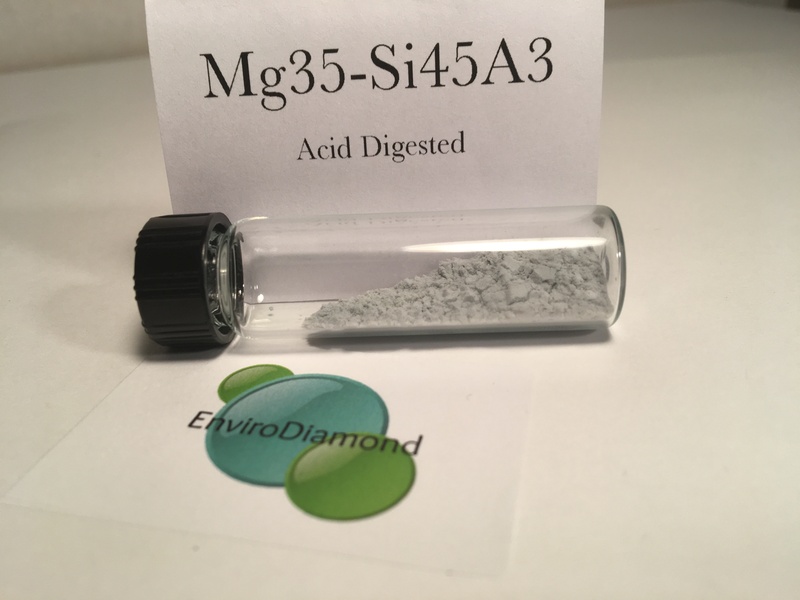 Interestingly, when the magnesium oxide phase is acid digested, the remaining material from a silicon enhanced detonation is so incredibly fine that a container of it behaves like liquid. The addition of silicon to a magnesium formulation also affects detonation mechanics. We can control the detonation pressure two ways: by controlling the energy output per gram of formulation and through adjusting density prior to detonation, which controls energy output per unit volume. We have produced buckets of this amazing powder. Aluminum-based CDP powders are very dense, dark, fine and free-flowing combinations of aluminum oxide, carbon and diamond. Aluminum oxide is a commonly used abrasive and relatively inexpensive. 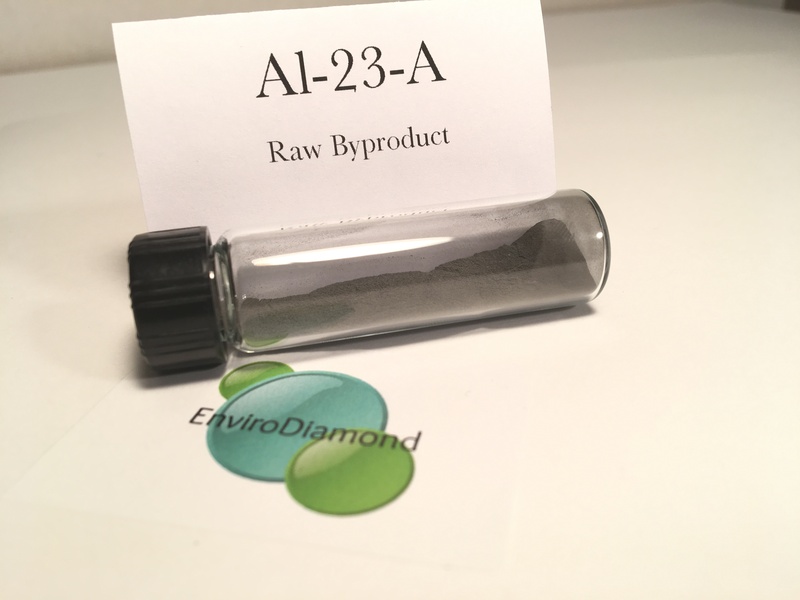 EnviroDiamond’s aluminum oxide, however, is fortified by diamond and other hard structures, which renders it a boutique version of what is typically a common commodity. Microscopy has revealed that the particles are highly spheroidal however, which in theory does not bode well for its use as an abrasive. 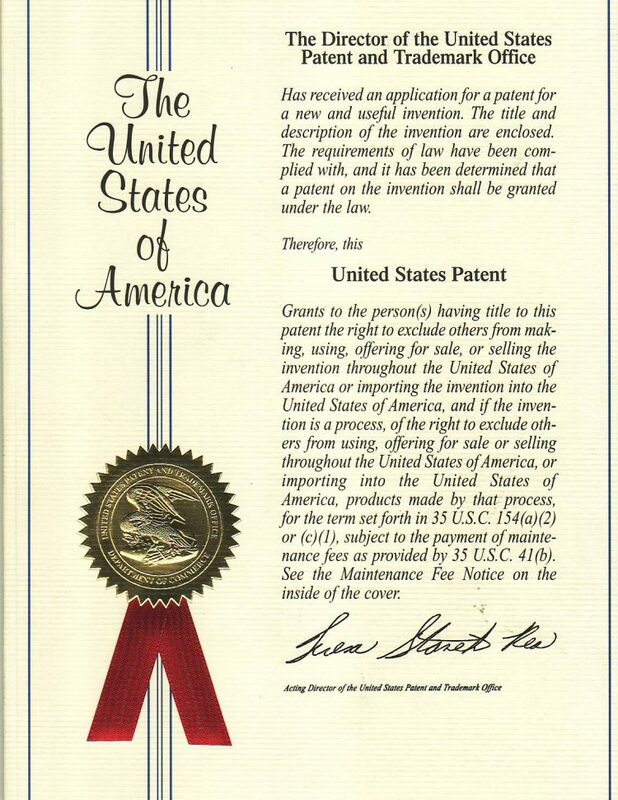 Our current focus is to develop products based on magnesium and carbon dioxide detonations and we can’t WAIT to shift gears to aluminum. Why? The aluminum oxide phase is so resistant to acid and heat that perfecting these products may potentially result in a material that rivals very expensive diamond powder. Nathan giving us the thumbs-up to proceed with the Deto-Nathan. Combining and detonating these ingredients is theorized to produce aluminum oxide and carbides of boron and silicon, which are all commonly used in the construction of bullet proof composites. 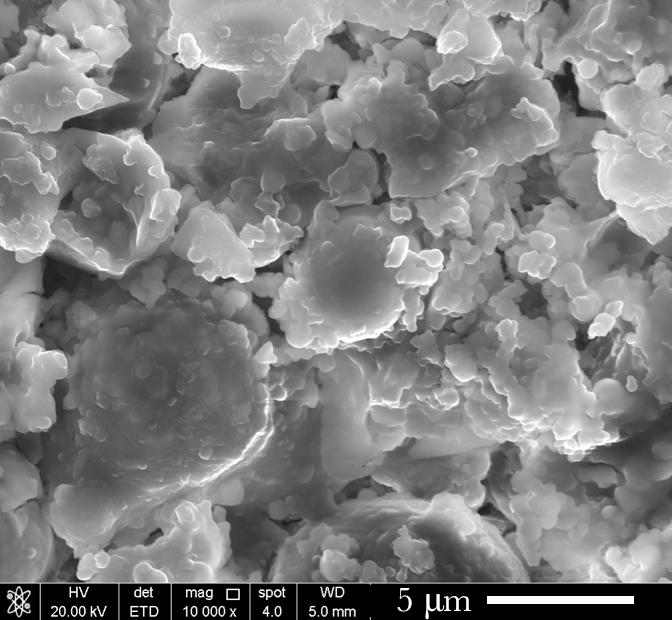 We plan to investigate whether nano-intimate combinations of these hard materials in our powders can be leveraged to improve the bulk composite’s effectiveness at stopping bullets. 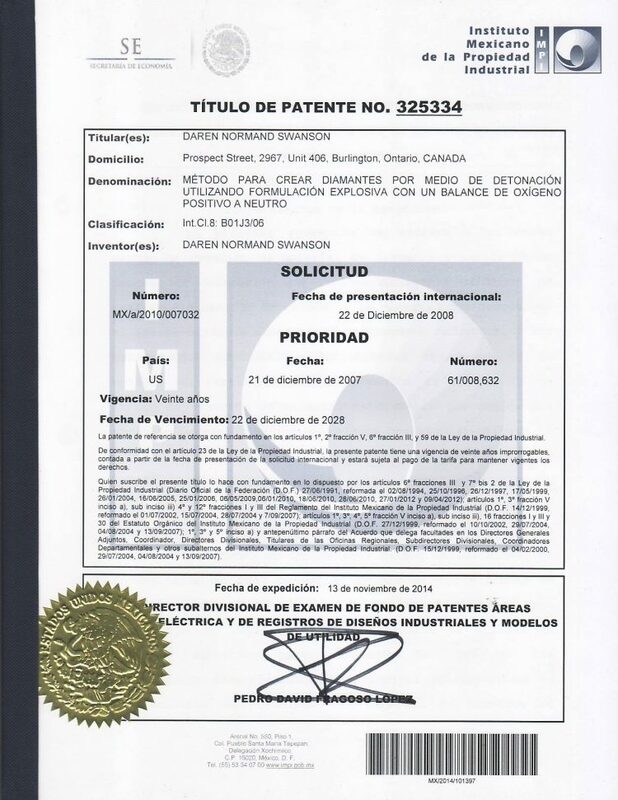 We envision that the powder produced from this type of detonation can be pressed into solid pieces that outperform typical composites that are based on the combination of pure materials. Interestingly, when this works out we can say that an explosion can be used to stop a bullet! 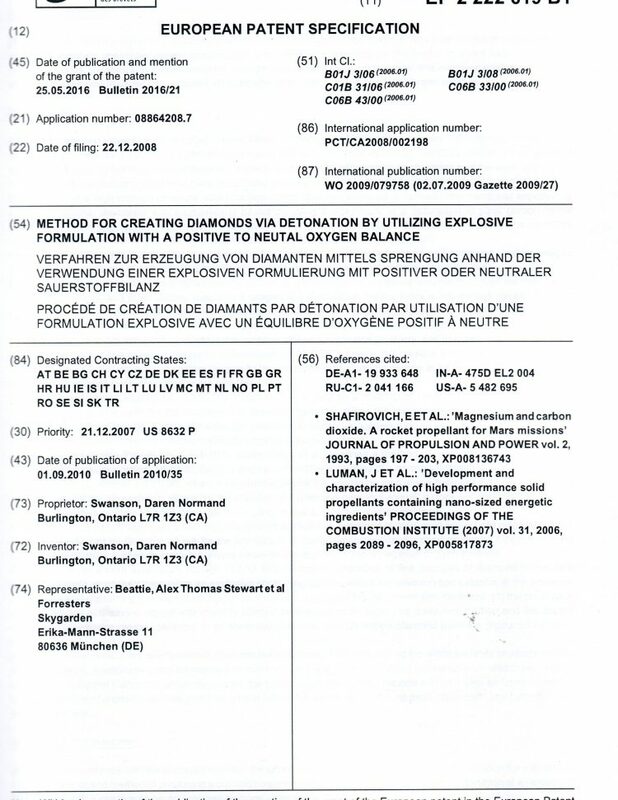 Something for fun: As an expression of appreciation for the talents and achievements of actor Nathan Fillion, EnviroDiamond dedicated the first Aluminum/Boron/Silicon CDP detonation test to him. 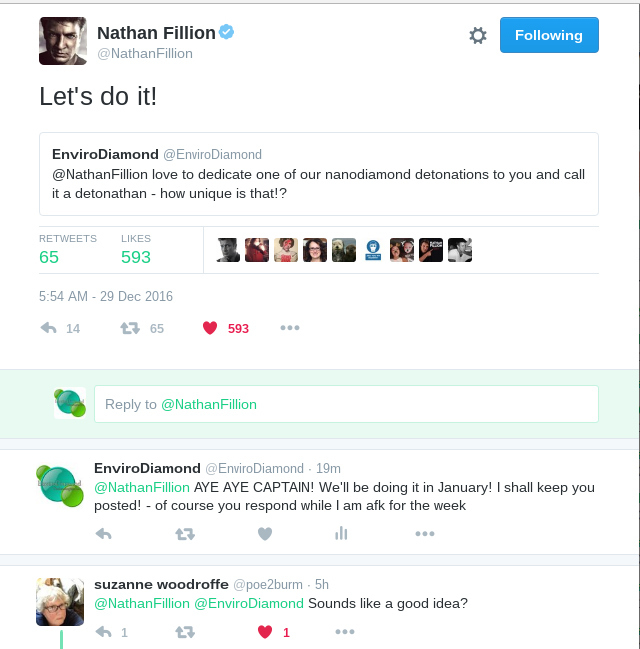 We named the formulation the “Fillion Formula” and this “Deto-Nathan” dedication was fun to put together for him and post to his Twitter feed, which he then re-tweeted to his fans!! We have decided to make the video available here for your enjoyment and to show you a little bit about our process.